Property Size 1,000 sq. ft. Spacious and beautifully decorated 2 bedroom in San Diego’s east village. Steps from the Gaslamp disctict. 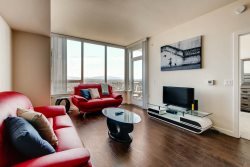 This apartment is on a high floor in a luxury building with floor to ceiling windows and has incredible, panoramic views. Conveniently located among countless popular bars and restaurants. The east village is home to elegant rooftop bars, Petco Park and a host of fine dining options. Enjoy a full service building with a gym, lounge, and high end fitness facility.